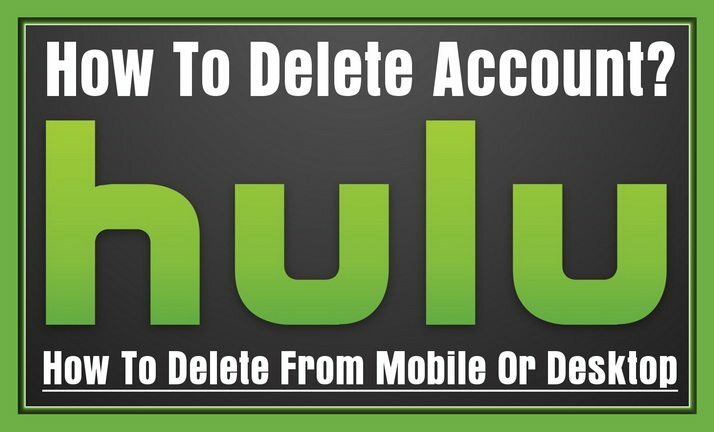 How Do You Delete Your Hulu Account? Before starting the process of deleting your account, one thing you should know is that if you signed up for a paid subscription, you will need to cancel that first. Many people who use Hulu do so with a free account, and some subscribers who cancel still want to utilize the free service. For this and other reasons, Hulu has separate processes for cancelling subscriptions and deleting accounts. If you have a free account, skip down to the directions for deleting your account. Go to the Hulu homepage (https://www.hulu.com) and click on the Account Login link. If you are already logged in, click on the Manage Account link to go to your account settings. (If you are not already logged in) Log in using the email address you signed up for the account with and the password you created for your account. Find your name in the upper right-hand corner of the screen and click on it. Scroll down to the bottom of the page to find the “Cancel Your Subscription” option, located on the right side of the screen, and click on Cancel. Click on “Continue to Cancel” when the pop-up window appears. This in the bottom right-hand corner of the pop-up, and will take you to another page where you will be asked why you want to cancel. Select a reason why you wish to cancel. If you select “Other”, you will need to type a reason into the text box that appears before you can go forward. After you select a reason, click on the “Continue to Cancel” button at the bottom of the screen, which will take you to another page. On the last page, you can confirm your cancellation by clicking on “Yes, Cancel My Subscription”. Open the Hulu app by tapping on the light green icon with “hulu” written over it on the screen. Login using your normal log in method if the app does not automatically log you in. Tap on the Account icon on the bottom right hand of your screen. This will take you to the Account page in the app. Tap on the Account option at the top of the Account page. If the app asks you to enter your password again, do so. Scroll down to the bottom of your screen and the Cancel Your Subscription option. Tap “Cancel”. Tap Continue to Cancel at the bottom of the next screen, and select a reason for canceling from the list that comes up. Tap Continue to Cancel at the bottom of the screen to continue. Tap on Yes, Cancel Subscription. This will take you back to your account page. Open your iPhone’s settings by tapping on the grey icon with gears on it (this should be on your home screen). At the top of your settings page, tap on your Apple ID name card. Scroll down to the middle of the page and tap on iTunes & App Store. Tap on your Apple ID at the top of the page. When the pop-up menu appears, tap on View Apple ID (it should be somewhere near the top). If prompted, enter your Apple ID password. If Touch ID is set up, scan your fingerprint to log in. Tap on Subscriptions at the bottom of the page. Tap on Hulu (skip this step if you are not subscribed to anything else through iTunes, because you will be redirected to Hulu). Find the Automatic Renewal switch, which will be green, and tap on it. The switch will turn grey to indicate that you have canceled. If you are not already logged in, go to the Hulu homepage (https://www.hulu.com) and click on the Account Login link. Log in using the email address you used to set up your account and the password you created for the account. If you are already logged in, click on Manage Account link to go to your account settings. From there, scroll down to the Your Account section, and click on the Update link next to the Personal Info subheading. This will take you to another page. On the new page, find the “Delete My Free Hulu” account link and click on it. You will be prompted to enter your password again, which Hulu has you do as a way to make sure your account is not accidentally deleted. Enter it, then click on “Yes, delete my account” to confirm that you are deleting your account. NOTE: Not using HULU anymore but still using Netflix? If you are in a country other than the USA, you are not getting all the same content to watch. If you want to try changing your DNS codes for Netflix, click on the link to read more and how to get more content to watch if you are a Netflix subscriber in other countries. Need extra assistance? Please let us know and we can answer your questions about cancelling hulu.